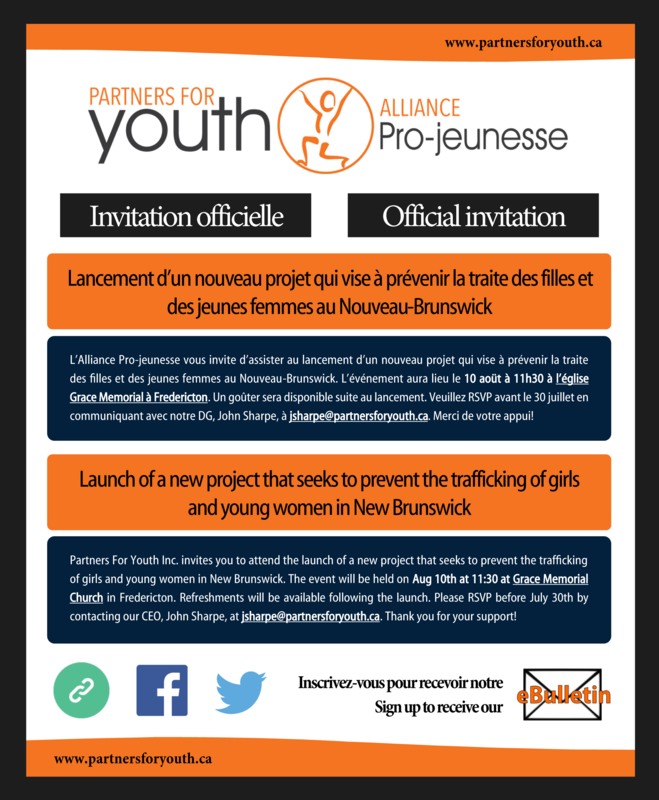 On August 10th, Partners For Youth Inc. (PFY) will launch a new three year project designed to help reduce and prevent the trafficking of girls and young women in New Brunswick. 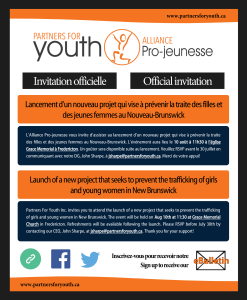 Financed with an investment of $200,000 by Status of Women Canada, and with additional in-kind support from the Government of New Brunswick, the project will tap into new partnerships between PFY, law enforcement agencies, community organizations, and other key stakeholders throughout the province. Recent reports from the RCMP and the Canadian Women’s Foundation have identified human trafficking as an area of growing concern. In Canada, the majority of victims in these cases girls and young women, ages 14 to 22, who are trafficked for the purpose of sexual exploitation. This new project will lead to the development of a comprehensive, community-based provincial strategy for reducing and preventing the growth of human trafficking in the province. The launch event will be held on August 10th at 11:30 at Grace Memorial Church in Fredericton. Refreshments will be available following the launch. All are welcome to attend; however, we ask that people RSVP before July 30th by contacting us directly.